Unionist Voice is running a 3 week ‘Stand Up Against Sectarianism’ #SUAS series. Each day we will highlight republican sectarianism and/or ethnic cleansing. Today we focus on the slaughter of 10 Protestants in what is known as the Kingsmill massacre. The brutal IRA killing of 10 innocent Protestant workmen took place on the 5 January 1976 in County Armagh. 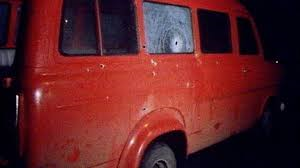 Gunmen, which included Omagh bomber Colm Murphy, stopped a mini bus carrying eleven Protestant workmen. The sectarian IRA gang then placed the innocent men up against the mini bus and shot them all. One victim, Alan Black, survived despite being shot 18 times. A Historical Enquiries Team report confirmed that the sectarian slaughter was carried out simply because the victims were Protestants. The weapons used were linked to upwards of 110 other sectarian attacks. No one has ever been convicted of their role in the sectarian slaughter, despite the identity of many of the gunmen being widely known. 99 Responses to "#SUAS- The Kingsmill massacre"
Thanks for a marvelous posting! I certainly enjoyed reading it, you are a great author.I will make certain to bookmark your blog and definitely will come back sometime soon. I want to encourage one to continue your great work, have a nice afternoon! Good day very cool blog!! Man .. Excellent .. Wonderful .. I will bookmark your web site and take the feeds additionally…I’m glad to search out numerous helpful information right here in the post, we want develop extra strategies on this regard, thanks for sharing. . . . . . I was very pleased to search out this web-site.I wanted to thanks for your time for this wonderful read!! I definitely enjoying each little bit of it and I have you bookmarked to take a look at new stuff you blog post. F*ckin’ remarkable issues here. I’m very glad to look your article. Thanks so much and i’m having a look forward to contact you. Will you please drop me a e-mail? I do accept as true with all of the ideas you’ve presented in your post. They are really convincing and can certainly work. Nonetheless, the posts are very short for novices. May just you please prolong them a little from next time? Thanks for the post. Pretty section of content. I simply stumbled upon your blog and in accession capital to assert that I get in fact loved account your weblog posts. Anyway I will be subscribing to your feeds or even I fulfillment you get admission to constantly rapidly. Hello There. I found your blog using msn. This is a really well written article. I?ll make sure to bookmark it and come back to read more of your useful information. Thanks for the post. I?ll definitely return. A lot of what you claim happens to be supprisingly appropriate and it makes me wonder why I had not looked at this in this light before. This article truly did switch the light on for me as far as this particular subject matter goes. Nevertheless at this time there is 1 point I am not really too comfortable with and while I make an effort to reconcile that with the actual core idea of your point, permit me see exactly what the rest of your subscribers have to say.Very well done. Appreciating the time and effort you put into your website and detailed information you present. It’s great to come across a blog every once in a while that isn’t the same old rehashed material. Wonderful read! I’ve bookmarked your site and I’m adding your RSS feeds to my Google account. you’re really a good webmaster. The web site loading speed is amazing. It sort of feels that you’re doing any unique trick. Also, The contents are masterwork. you have performed a fantastic job in this matter! Public arrest records st louis missouri, http://affordable-background-checks.stream erase criminal record. I do not even know the way I finished up here, however I assumed this publish was once good. I don’t realize who you’re but definitely you are going to a famous blogger when you aren’t already 😉 Cheers! Have you ever thought about including a little bit more than just your articles? I mean, what you say is fundamental and all. But imagine if you added some great photos or video clips to give your posts more, “pop”! Your content is excellent but with pics and clips, this website could certainly be one of the best in its field. Wonderful blog! I do enjoy the way you have presented this situation and it does indeed give me some fodder for consideration. Nonetheless, because of what I have personally seen, I simply wish as the actual opinions pack on that people today continue to be on issue and in no way get started on a tirade of some other news du jour. Yet, thank you for this fantastic point and although I do not concur with this in totality, I regard your point of view. I was just seeking this information for a while. After six hours of continuous Googleing, finally I got it in your web site. I wonder what’s the lack of Google strategy that do not rank this type of informative web sites in top of the list. Normally the top web sites are full of garbage. Good day I am so glad I found your webpage, I really found you by error, while I was researching on Askjeeve for something else, Anyhow I am here now and would just like to say thanks a lot for a tremendous post and a all round exciting blog (I also love the theme/design), I don’t have time to read through it all at the moment but I have bookmarked it and also added your RSS feeds, so when I have time I will be back to read a lot more, Please do keep up the superb work. I am typically to blogging and i actually admire your content. The article has actually peaks my interest. I’m going to bookmark your web site and hold checking for brand new information. Hello would you mind letting me know which webhost you’re working with? I’ve loaded your blog in 3 different browsers and I must say this blog loads a lot faster then most. Can you suggest a good hosting provider at a reasonable price? Thank you, I appreciate it! I was just seeking this info for a while. After 6 hours of continuous Googleing, at last I got it in your web site. I wonder what is the lack of Google strategy that do not rank this kind of informative websites in top of the list. Generally the top sites are full of garbage. Hi mates, pleasant article and fastidious arguments commented here, I am really enjoying by these.